Now that Bam Bam is off on his school adventures, he misses on out joining mummy in the kitchen. 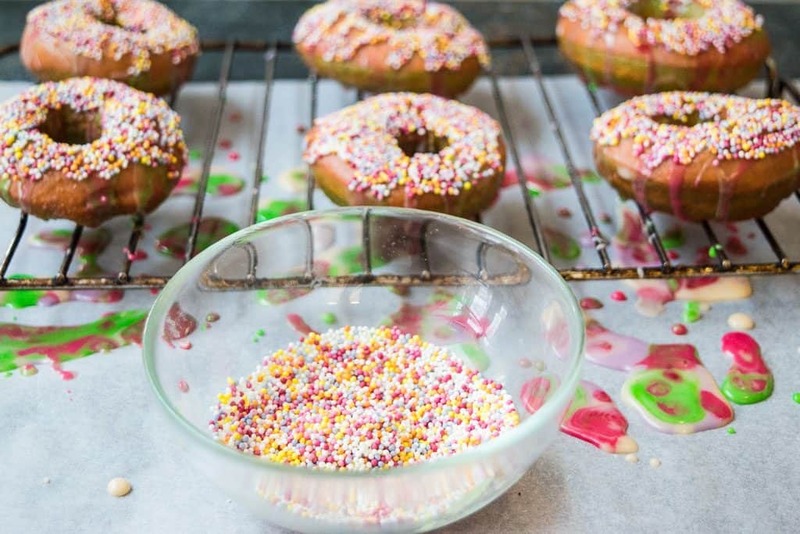 He loves a little baking project and these doughnuts are great for the kids to join in with on a rainy baking day. I am not trying to tempt fate with “rainy days” since this summer seems to be extra long this year. But as the dark evenings creep in, there’s no denying winter is on it’s way. 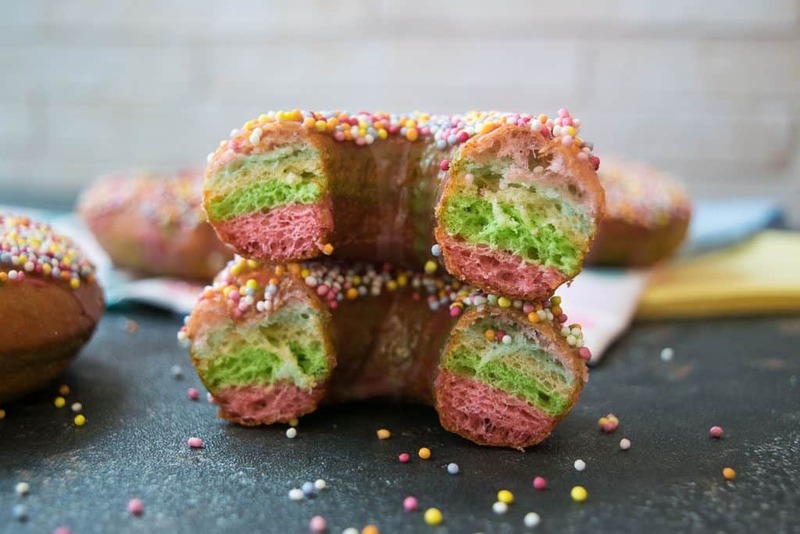 So, with these multi-coloured doughnuts we can keep a bit of colour in our lives. Brightening up a dull day, creating food that makes us smile. 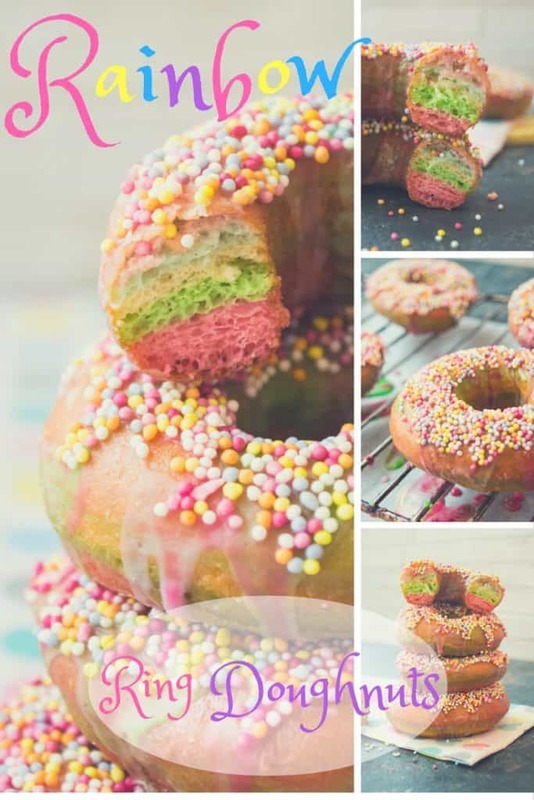 These doughnuts actually tempt me into making all my food multi-coloured. But, I shall try and resist the urge. 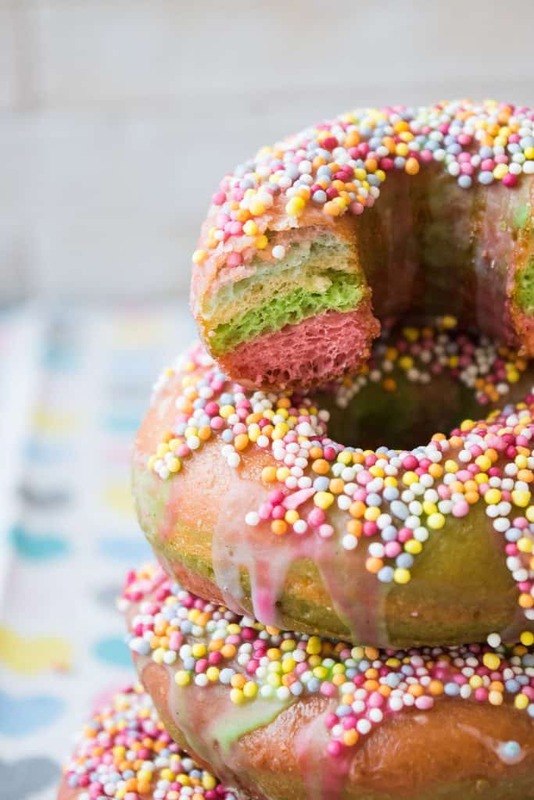 I may get some strange looks from the kids when I serve them up a plate of rainbow wedges or similar….It would be kinda fun though! 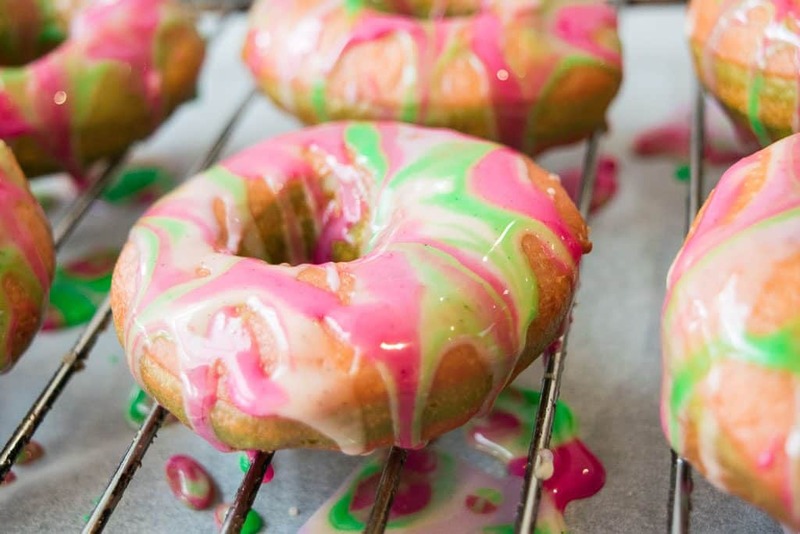 These glazed doughnuts don’t skimp on taste either! They are so yummy! They don’t stay fresh for long. But, I am sure you will probably eaten them all before the time you would notice. 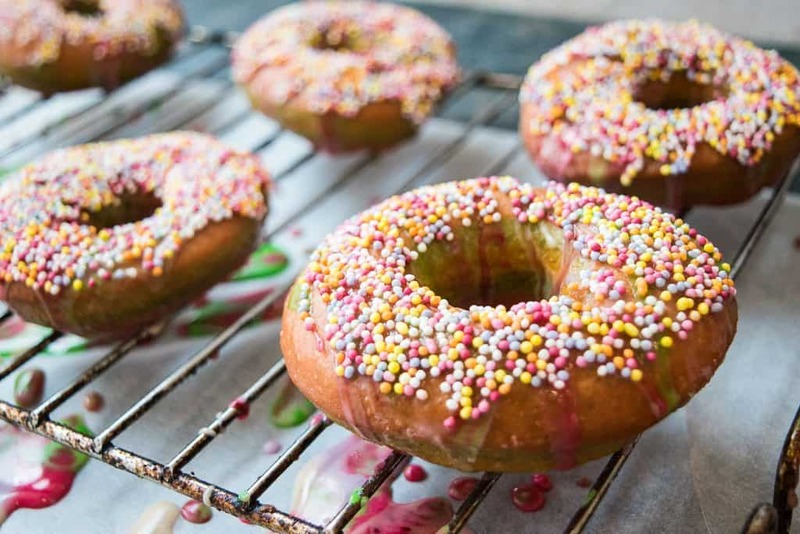 Ideally, you need to use a ring doughnut cutter. However, don’t worry if you don’t have one. Just use round cookie cutters (one big, one small) instead, to create the shape. When you have cut the doughnuts out, you don’t need to waste the excess. Just roll it back up and roll it out again and you’ll have a swirly rainbow pattern inside instead. 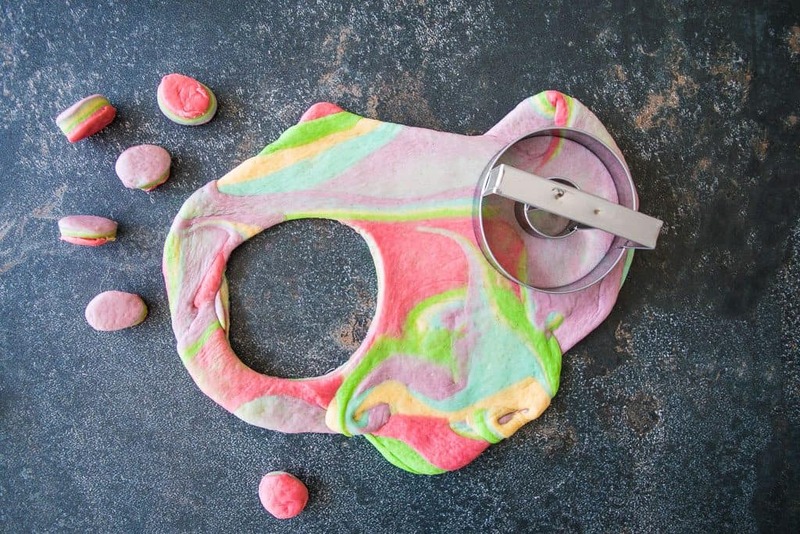 Just be aware that if you overmix your dough the colours will end up blending together and won’t look good, so only do this once. A little tip, don’t let the oil get too hot. Otherwise, the doughnuts will darken too quickly and won’t cook through so keep the oil at an even temperature. To test it, drop a little piece of bread into it and wait for it to brown. When this has happened the oil is ready so turn the heat down at this point to keep it around the right temperature. 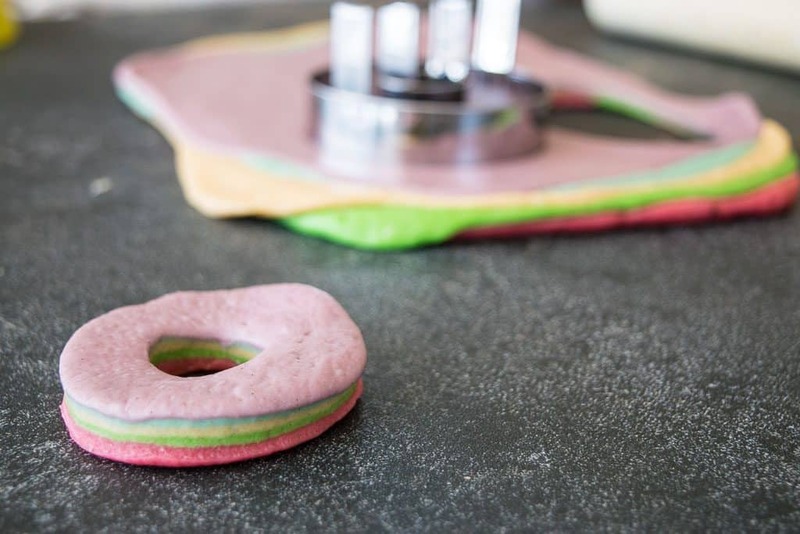 So, go enjoy some rainbow coloured fun in the kitchen with the kids. 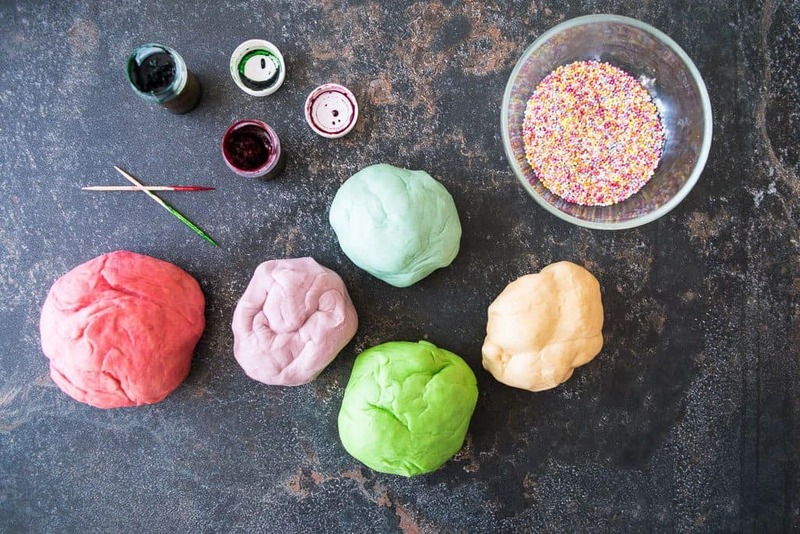 If you’re looking for some more colourful, fun kitchen projects. Check out these Party Rings now. Heat the milk until it’s luke warm and add the sugar, stir until dissolved. Remove the dough from the bowl and divide into 4 or 5 (depending on how many colours you’d like to use).